Caribbean spa hotels offer transcending relaxation with luxurious steam baths, private pools and signature treatments using local ingredients. 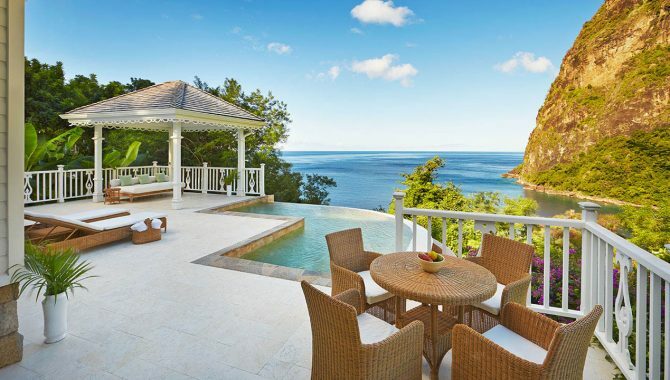 You’ll feel as though you’ve hit the lottery while being pampered with a much-needed massage as you gaze out into the sparkling Caribbean Sea. 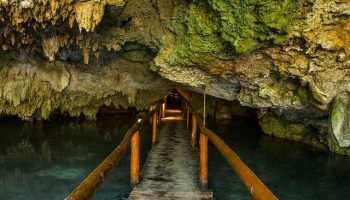 These postcard-perfect destinations boast backdrops so alluring that you’ll practically feel your worries melting away. 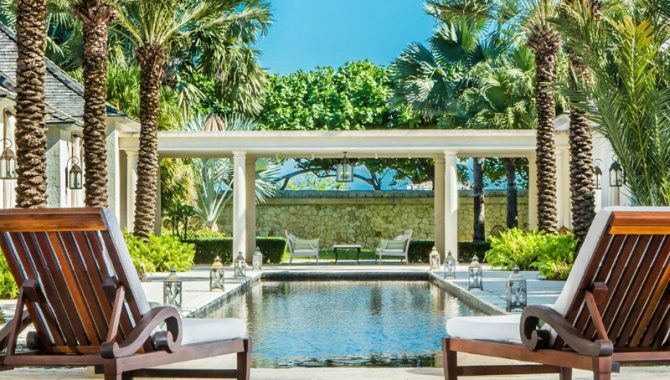 From St. Lucia to the Dominican Republic, Jamaica and Puerto Rico, these are the best Caribbean hotel spas to experience pure bliss. 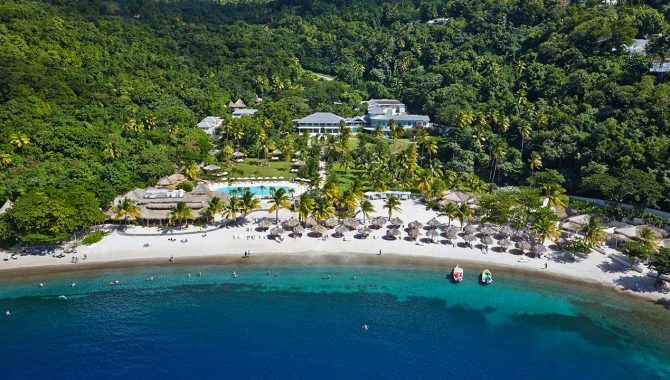 Sugar Beach, A Viceroy Resort in St. Lucia is set within 100 acres of lush rainforest landscapes on the stunning, white-sand Sugar Beach between the towering Pitons. After a day of snorkeling and diving just offshore, visit the hotel’s romantic treehouse spa for the pampering of a lifetime. Using local ingredients like banana, coconut and cocoa butter, the Rainforest Spa’s natural and holistic treatments include bamboo massages, hot rock therapies, body wraps and salt scrubs. Top it off with a manicure and pedicure or relax in the Amerindian steam dome, then wrap up your day in one of the hotel’s luxury villas or beachfront bungalows that come with personalized butler services. 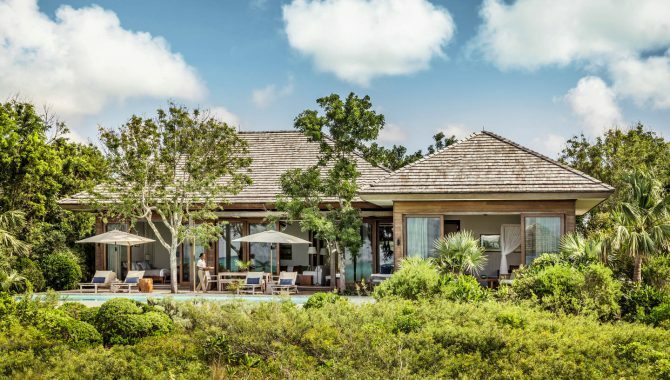 COMO Parrot Cay is the embodiment of a luxurious Caribbean resort, nestled on one of the most beautiful beaches in Turks and Caicos on its own private island. The standout feature is the hotel’s renowned COMO Shambhala spa that has a yoga pavilion, outdoor Jacuzzi garden, Pilates studio, Japanese baths and nine treatment rooms. You can get a massage with traditional techniques from Indonesia and Thailand or an Indian Head Massage to relieve muscle tension in the neck and shoulders. After your treatment, relax in your Balinese-style villa with a private pool or take a dip in the hotel’s sparkling infinity pool with a tropical cocktail. 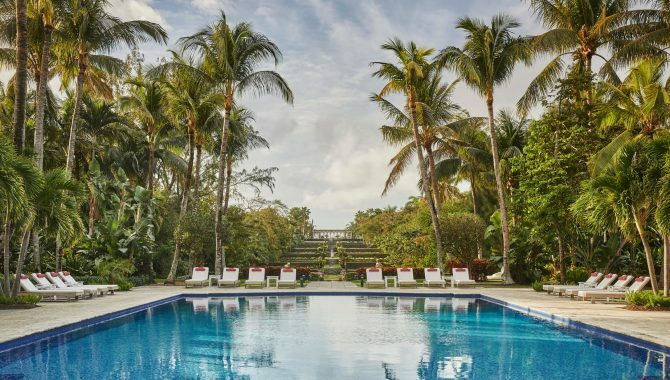 Located on a picturesque white-sand beach on Paradise Island, The Ocean Club, A Four Seasons Resort has low-rise accommodations situated on 35 acres of Versailles-inspired gardens. After you’ve eaten breakfast on your private balcony, play a round of golf at the Ocean Club Golf Course or head to the Balinese-style spa for a day of pampering. Nourish your senses with an intensely cleansing salt scrub and body nectar nourishing wrap or reset with a flower detox wrap or freestyle deep tissue massage. The spa’s signature Coconut Poultice Massage uses frangipani monoi body oil—yes, please! Wrap up your day with a nightcap at the hotel’s Martini Bar and Lounge. 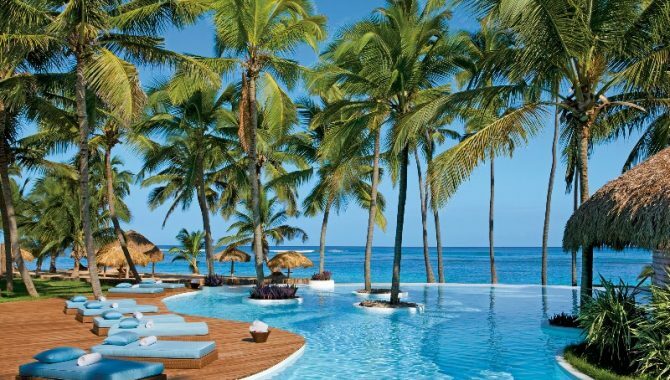 One of the best all-inclusive resorts in the Dominican Republic, Zoetry Agua Punta Cana, is known for its tranquil ambiance, spacious suites and uncrowded white-sand beach. Boasting an Endless Privileges service, guests enjoy unlimited top-shelf spirits, no formal check-in or check-out times and access to four gourmet restaurants. Take a break at the hotel’s spa that is designed for couples and solo travelers, as it specializes in tension-releasing massages in addition to facial and body treatments. The spa menu is comprised of various spa packages, including a Welcome to Zoetry deal that includes a foot bath, sea mud wrap, Swedish massage and facial. Couples will love the Romantic Escape package that includes chocolate-covered strawberries, while the Just For Her package has a citrus scrub and spa manicure. 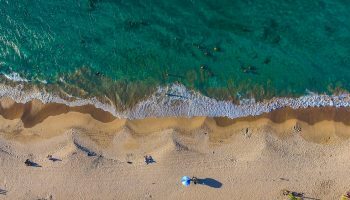 It’s hard not to be lured in by Jamaica’s iconic Half Moon Resort, an oceanfront property that sits near two beautiful beaches in Montego Bay’s Rose Hall area. 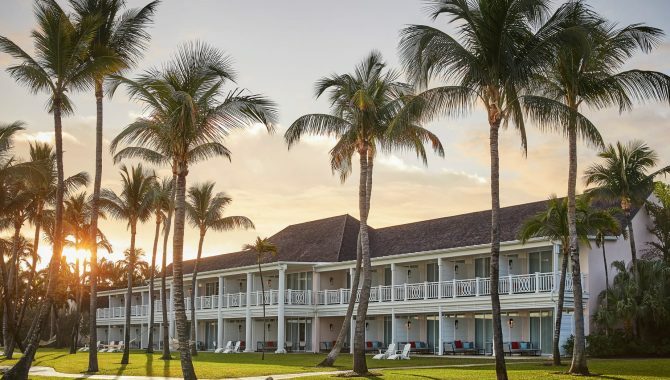 Its spacious guest rooms feature private balconies with ocean views, while the hotel’s centerpiece is its award-winning Fern Tree spa that sits amongst fragrant fruit trees. Step inside the spa’s overwater cabana to discover a menu that includes massages and salon treatments, while the sauna, oceanfront yoga room and multiple pools ensure that you’ll leave completely rejuvenated. Even guys can get in on the action with the Gentlemen’s Spa specializing in massages for golfers and tennis enthusiasts, scalp and foot massages and a facial that soothes shaved skin. 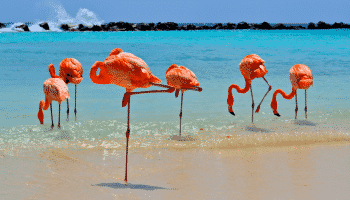 After you’re refreshed, take a 15-minute drive to Montego Bay’s Hip Strip lined with shops, restaurants and bars. 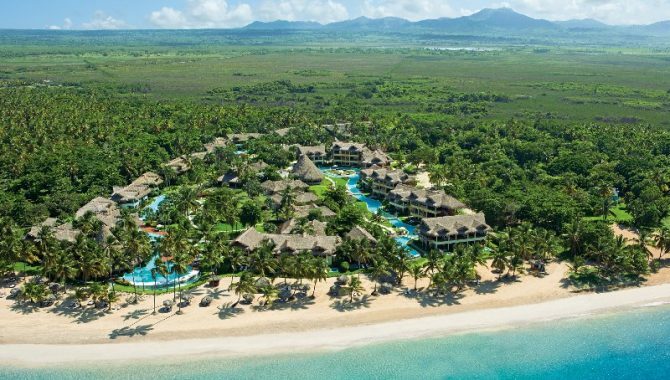 Finding serenity is easy at Dorado Beach, a Ritz-Carlton Reserve in Puerto Rico. Stroll along the sun-drenched beach, hike the beachfront 11-mile Rockefeller Trail or relax at the hotel’s open-air treehouse spa. Once inside Spa Botanico you’ll discover a fragrant pineapple garden and enjoy signature body scrubs. Treatments include the Coffee & Clove, Sweet Line & Lemongrass or Spiced Bay & Coconut scrub, containing anti-aging properties leaving your skin feeling soft and renewed. After your treatment, hang out in the spa’s hot and cold plunge pools or admire the views from your oceanfront suite through the floor-to-ceiling glass doors, deep soaking tub or outdoor shower. Rockhouse Hotel offers intimate ambiance with only 34 rooms and a cliffside setting that’s best enjoyed from the ocean-view swimming pool. 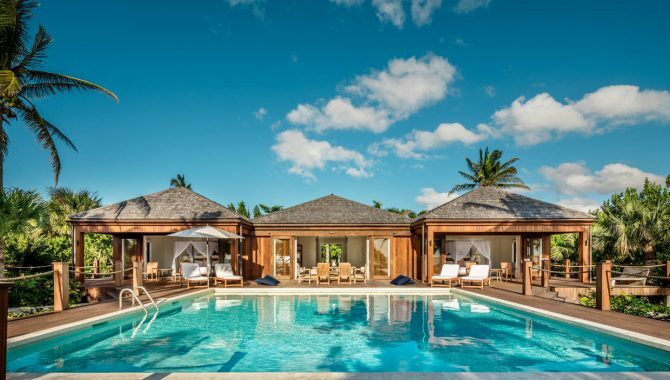 Enjoy the adults-only atmosphere at the on-site spa, which is centered around a thatched-roof hut on a private sundeck where the sound of crashing waves enhances your massage. Start with a foot-cleansing ritual with fresh ocean water, then indulge in a Coffee Scrub or Island Mint Tea wrap. For a fresh look, book the Beyond Beauty facial that reduces fine lines and wrinkles. After you’ve been pampered from head to toe, take a three-minute drive south to Rick’s Cafe, an iconic Negril spot known for its live reggae, cliff diving and sunset cocktails. 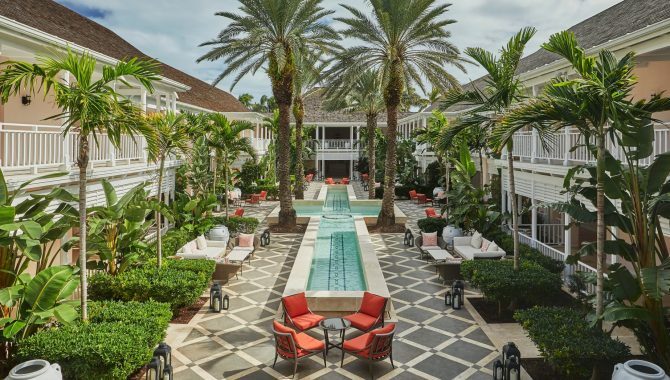 The Palms in Turks and Caicos is a beautiful 72-suite resort that sits on 12 acres in the heart of Grace Bay Beach, which has been ranked among the most stunning white-sand beaches in the world. 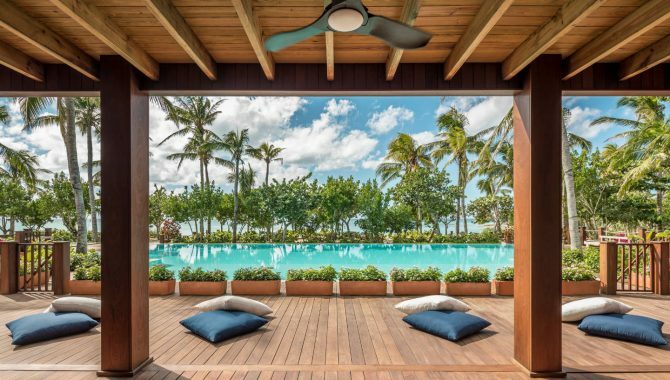 The hotel’s award-winning, 25,000-square-foot spa sits by a meditative courtyard and T-shaped reflecting pool lined with individual treatment cabanas. It’s here that you treat all your senses to a luxurious getaway with spa packages that include herbal steams, aromatherapy treatments and a “Moonlight and Stars” package that includes a couples massage with champagne on a patio under a canopy of stars. 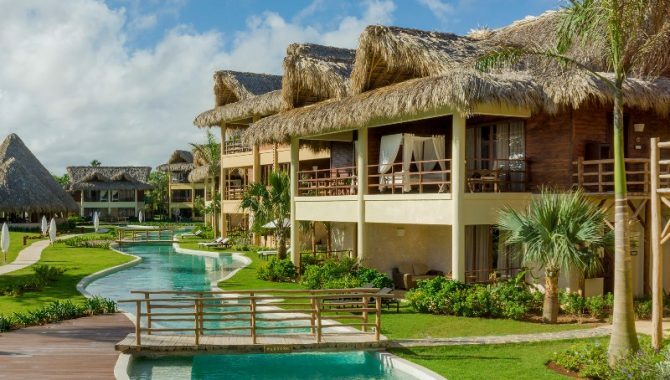 You’re spoiled for choice with activities at Sanctuary Cap Cana by Playa Hotels & Resorts in the Dominican Republic with its lagoon-shaped infinity-edge pool, live nightly entertainment, alluring beach and luxurious spa. 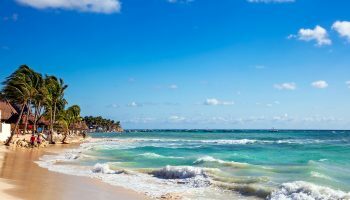 Although the adults-only hotel is only a 30-minute drive from the lively tourist area of Bavaro, you won’t have to venture far to try something new, as this all-inclusive resort boasts some of the best restaurants in the Dominican Republic. In the world-class spa you’ll discover a spacious courtyard area dotted with treatment rooms, while whirlpools, steam rooms, a sauna and a juice bar are also available. Offering a sanctuary for the senses, indulge in a combination of hydrotherapy and indigenous treatments including couples massages, aromatherapy, hydrotherapy and facials. 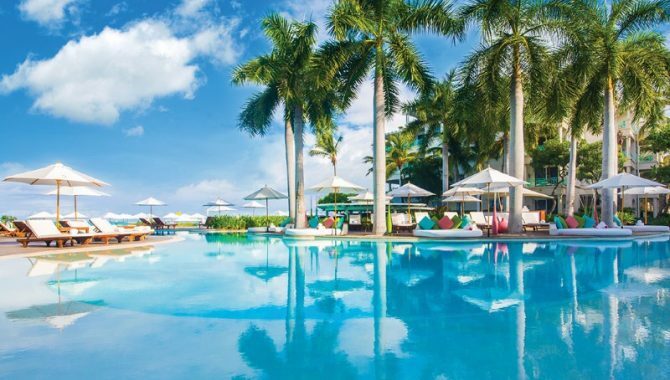 It’s hard to compete with the natural beauty of Grand Cayman, yet The Ritz-Carlton Grand Cayman does just that with its lush tropical surroundings, two outdoor pools, six restaurants and luxurious spa. 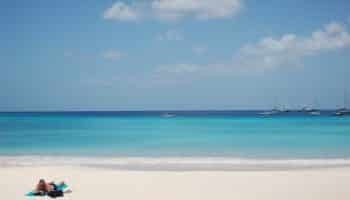 As if the white sand and turquoise waters of Seven Mile Beach at the hotel’s front door isn’t enough, the La Prairie spa elevates the hotel’s status with relaxation lounges and a sumptuous spa menu. You’ll feel like royalty with a La Prairie Signature Facial or Caviar Massage in a private luxury cabana, but the 60-minute Total Escape package is the ultimate in relaxation. 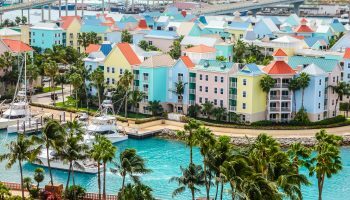 It comes with a Swedish Massage, facial, manicure and pedicure that will have you feeling refreshed, ready to take the entire family to the on-site Starfish Cay with its interactive water nozzles, slides and zero-entry splash pools.